18 The PCB Magazine • March 2016 by Dave Dibble In the area of increasing profitability, what I am sharing with you here is a true account of what I believe is an unprecedented event in the history of modern business. Within this story you will be introduced to a new theory and practice that will allow you to optimize re- sults and increase profitability in your business as never before. Although the following story is not set in the high-technology or interconnect industries, I assure you, and experience proves, that the principles outlined in this story and ar- ticle will work in a similar fashion in your busi- ness, assuming leadership is willing to grow and change. 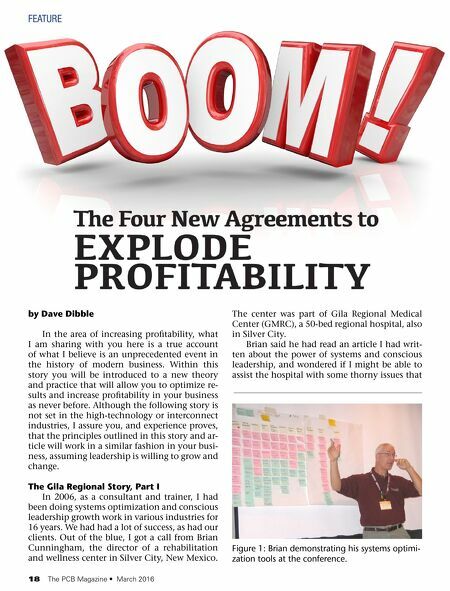 The Gila Regional Story, Part I In 2006, as a consultant and trainer, I had been doing systems optimization and conscious leadership growth work in various industries for 16 years. We had had a lot of success, as had our clients. Out of the blue, I got a call from Brian Cunningham, the director of a rehabilitation and wellness center in Silver City, New Mexico. The center was part of Gila Regional Medical Center (GMRC), a 50-bed regional hospital, also in Silver City. Brian said he had read an article I had writ- ten about the power of systems and conscious leadership, and wondered if I might be able to assist the hospital with some thorny issues that feature Figure 1: Brian demonstrating his systems optimi- zation tools at the conference.